The Burning or El Ardour in Spanish is an odd film. An Argentinian – Brazilian – Mexican co-production, while it looks very beautiful sometimes on screen and there are some impressive performances, it doesn’t quite leap off the screen. 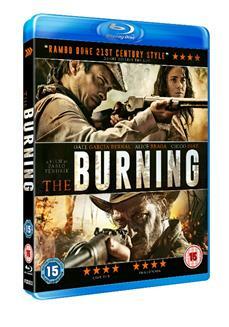 The Burning feels like a western except that the setting here is the Amazon. The plot could work in a Western with a few changes too: A mysterious man, Kai (Gael Garcia Bernal) emerges from the Argentinean rainforest to rescue the kidnapped daughter of a poor farmer, Vania (Alice Braga) after mercenaries murder her father and take over his property. The Burning moves at a glacial pace sometimes and the conclusion, which implies that Kai is some sort of forest spirit, facing off against a jaguar, feels contrived. There are some good solid performances with chemistry between Braga and Bernal but it all feel quite slight and unsatisfying at the end. It’s an intriguing film but ultimately a frustrating one.